We advocate for the improvement of personal and community health through the development of policy alternatives based on the best available qualitative and quantitative evidence. As a membership-based organization, we respond to issues of concern to the Canadian public and public health community. These issues are often broad and varied, and are not associated with any single discipline. We engage a broad range of researchers and practitioners to ensure the integrity and relevance of all of its position statements, policies, and advocacy activities. Advocate on issues as they arise. The following process has been adopted by the Board of Directors to achieve these objectives and to facilitate the active engagement of members in the development of evidence-informed policy alternatives. A statement made by the Association wherein it lends its name or provides a letter of support to another organization with respect to an externally-defined issue or initiative. This may include a press release. The decision to provide an endorsement is within the purview of the Executive Director following consultation with the Chair and Chair-elect when an existing Association policy is available to guide the decision. A stand-alone statement that explains, justifies or recommends a particular opinion or stance on an issue, which may lead to a policy declaration. It sends a public signal that CPHA is aware of/has concerns about the issue and sets the stage for possible subsequent work or action. Taking a position does not imply a commitment of action with attendant resources. A clear plan, with stated objectives, that is applied to our activities, procedures and decisions, and which directs future work or action, resources permitting. Endorsing or approving a policy implies a commitment of action and resources. Advocacy approaches used to advance initiatives that have been through this process are dependent on the topic and can range from letters of support to partner organizations, to a comprehensive advocacy strategy. 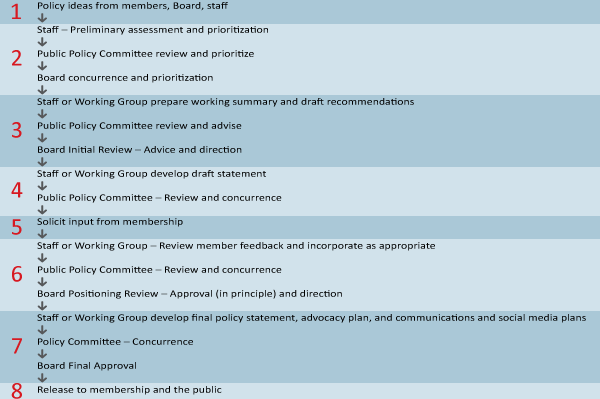 The Public Policy Committee, a standing committee of the Board of Directors, assists in identifying issues, suggesting priorities, developing options and providing recommendations to the Board of Directors regarding the development of positions, policy advice, and selected endorsements. It does not support the development of operational or managerial policy. The length of time required for us to make a decision will depend on the complexity of the issue, the level of volunteer member support for the initiative and the urgency. If you have a question about the policy process, please contact the Policy Department. The proponent is responsible for providing a completed Policy Proposal to our Policy Department. The Policy Department will then manage the document through the review and consideration process. The proponent must be a current member. The issue clearly falls within our mandate and mission. The issue is clearly within the domain of public health. The Association is able to make a tangible contribution to the issue. The Association has the potential to influence thinking and action on the issue. Ascertain that the issue relates to our strategic plan, an existing position or policy, or is an emerging public health issue. Complete and submit a Policy Proposal. Once the proposal has been submitted, the proponent will receive an acknowledgement of receipt. The Policy Department will review the submission and will communicate with the proponent if further information is required. Proponents should be willing to provide additional information as requested. Once deemed to meet the submission criteria, the proposal will be reviewed by the Public Policy Committee. The Committee will determine whether the proposal should be forwarded to the Board for a comprehensive review, whether additional information is required to make a decision, or reject the proposal. The Board of Directors is the ultimate decision-making body to approve or reject a proposal. Should the Board deem the proposal meritorious, it will prioritize it vis-à-vis the current policy development agenda and the policy development process will continue.